» Is it true that there are scars with FUE? 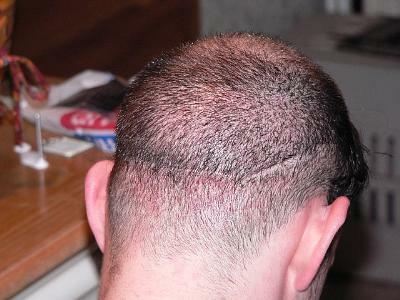 » guy who underwent FUE and subsequently shaved his head after he has healed? » Are the spots visible. » If they are, I won’t want a hair transplant even if its FUE. » I need to preserve the option of shaving it all off. » ever get used to it. Dr. Cole will perform the occasional strip procedure but he generally agrees with your initial sentiment: that FUT is an outdated technology. If I have FUE HT surgery with your clinic can you be sure that scarring will not show if I want to shave to stubble afterwards ? The answer from every clinic (including yours) was No. Scarring with FUE is of course nothing like Strip surgery in most instances, however, until I see FUE results that produce consistent megasession results such as the H&W clinic at similar prices then the idea that Strip should be banned/boycotted is frankly laughable. » will not show if I want to shave to stubble afterwards ? » The answer from every clinic (including yours) was No. » that Strip should be banned/boycotted is frankly laughable. So which procedure should you prefer? What does “PL FUT HST” stand for? » What does “PL FUT HST” stand for? 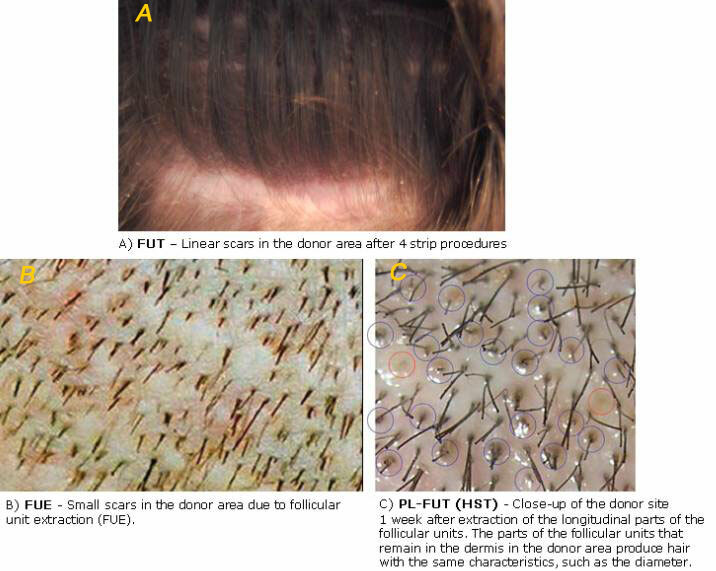 "Partial Longitudinal Follicular Unit Transplantation" (PL-FUT). “HST” is just the abbreviation for the registered trademark “HairStemcell Transplantation®” (HST) of this new HT technique. » » will not show if I want to shave to stubble afterwards ? » » The answer from every clinic (including yours) was No. » » that Strip should be banned/boycotted is frankly laughable. » So which procedure should you prefer? » A, B or C? hahaha good example. why fight over fue vs fue when there’s HST. btw, is it me of did half of the thread just vanish from everything north of emilie’s post? Yes, I noticed that…I promise I wouldn’t start a thread with such a divisive title! Really photos of good strip scars should be shown instead of a big 1cm wide scar. Try to find some LONG TERM “good strip scars” - good luck! But WHICH of the 3 scars you can see on the photo, you think is “the best” strip scar? » Try to find some LONG TERM “good strip scars” - good luck! Every scar I had from injuries/stitches has only become thinner over time. I have no idea why you think scars becomes worse over period of time. You probably had an outdated procedure 20/12 years back and still believe the current procedures produces the same scars. Go check out the scars results from H/W or Dr A’s clinic, the scars are thin and unnoticeable. There is no logic, that I know, in expecting these scars to become worse over a period of time. Also it is unreasonable to expect people who are extremely happy with the results to come and pose for scar shots 5 or 10 years after their surgery because you asked for it! You can look at Pats205’s Journal, he has a complete shaved head scar shot before his second procedure. Have you seen and good shaved head shots of head from a FUE after 8/10 years? Do you think FUE’s tiny scars will also become widened and scary after 8/10 years? » » Is it true that there are scars with FUE? » » Are the spots visible. » » If they are, I won’t want a hair transplant even if its FUE. » » I need to preserve the option of shaving it all off. » » A round bald head may be an embarrassment for a small amount of time. » » ever get used to it. » agrees with your initial sentiment: that FUT is an outdated technology. 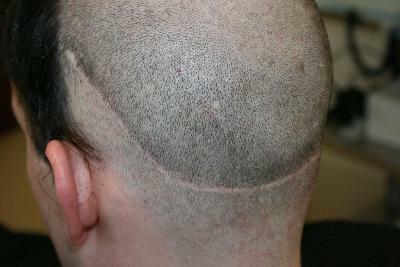 You can look at Pats205’s Journal, he has a complete shaved head scar shot before his second procedure. Here are photos of my strip scar. It is pretty thin, didn’t stretch at all. I had tri closure done. My strip scar has never been an issue, but I also choose to wear my hair longer in the back, just the way I prefer it, so it’s never been a problem for me. » all. I had tri closure done. » » all. I had tri closure done. You ever thought about growing up? The irony “ironman” here is to my knowledge you are one butchered patient well known on the german boards that’s gone through countless procedures yet still look like a deformed frankenstein. Now if you posted your pics and somene mocked you it wouldn’t be so nice now would it? Yeah, not sure what the joke is here. If you don’t think my scar is thin, then you are confused to what’s really out there. I have seen some horribly stretched scars… Mine is pretty damn thin compared to what I have seen both on the forums and in person. Right now ? It’s a tough call, it depends on your hair characteristics on whether it’s A or B - obviously not C at the moment because the evidence isn’t there yet that it actually works in practice. » » » all. I had tri closure done. » wouldn’t be so nice now would it? The point here is, that Pats205 claim his scar looks “pretty thin”. Now compare my (bad) 3 scars (actually 4) with Pats205’s scar from one ear to the other (and look at the side above his left ear!). Which one is - in general - is more “Frankenstein-like” as most Strip-Docs claim and hype out there ? BTW - It is NOT my intention to mock Pats205 in general, but I mock his formulation “pretty thin”. Why not “not really visible” ? » » » » all. I had tri closure done. » » wouldn’t be so nice now would it? » The point here is, that Pats205 claim his scar looks “pretty thin”. » formulation “pretty thin”. Why not “not really visible” ? » are you paranoid or something? O.k. - Pats205’s scar looks absolutely fantastic!